14 May 2007 (Nhan Dan) – Fortunately, it’s nothing like terrorism news, but rather an old -but dangerous- relic from the past. 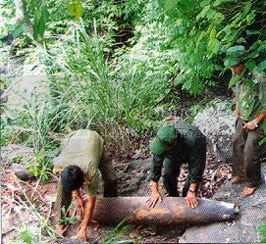 The management board of the My Son Sanctuary in Quang Nam province said engineers had succeeded in defusing a 500-kilogramme bomb in the B tower area on May 11. The bomb may have remained since the US army bombed the My Son Sanctuary in 1972.